U.S. swimmer Ryan Lochte issued an apology Friday morning about an incident that occurred early Sunday at the Rio Olympics. 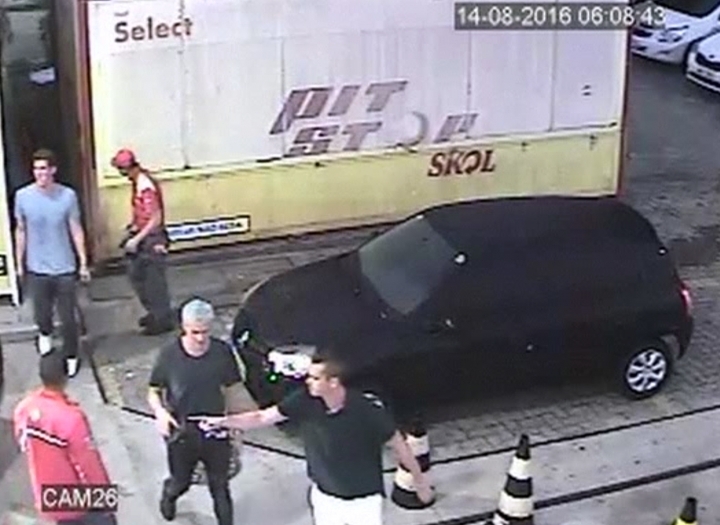 Lochte initially said he and three teammates had been robbed at gunpoint, but Rio police discounted that on Thursday and instead said the swimmers vandalized a gas station bathroom and then paid some guards before leaving. Following is the full text of Lochte's statement, posted to his Instagram account. It's traumatic to be out late with your friends in a foreign country — with a language barrier — and have a stranger point a gun at you and demand money to let you leave, but regardless of the behavior of anyone else that night, I should have been much more responsible in how I handled myself and for that am sorry to my teammates, my fans, my fellow competitors, my sponsors, and the hosts of this great event. I am very proud to represent my country in Olympic competition and this was a situation that could and should have been avoided. I accept responsibility for my role in this happening and have learned some valuable lessons. I am grateful for my USA Swimming teammates and the USOC, and appreciate all of the efforts of the IOC, the Rio '16 Host Committee, and the people of Brazil who welcomed us to Rio and worked so hard to make sure that these Olympic Games provided a lifetime of great new memories. There has already been too much said and too many valuable resources dedicated to what happened last weekend, so I hope we spend our time celebrating the great stories and performances of these Games and look ahead to celebrating future successes.